Hillary Clinton, also known as Hillary Rodham Clinton, is an American diplomat and politician. She was the Democratic Party’s nominee for President of the United States in 2016, when she won the popular vote, but not the electoral college. Hillary is the first woman to have been nominated for the Presidency by a major political party. As a Democrat, she has served as a U.S. Senator from New York, from January 3, 2001 to January 21, 2009, and as U.S. Secretary of State, from January 21, 2009 to February 1, 2013. Hillary’s father, Hugh Ellsworth Rodham, was of English and Welsh descent. Hillary’s mother, Dorothy Emma (Howell), had Welsh, English, Scottish, French, French-Canadian, and remote Dutch and Swiss-French, ancestry. Hillary is married to President Bill Clinton, and, as such, was First Lady of the United States, from 1993 to 2001. The couple’s daughter is Chelsea Clinton. 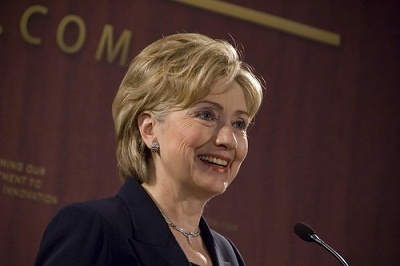 Hillary was also a candidate for the Democratic Party’s nomination for President of the United States in 2008. Hillary is the only woman to win a major party’s presidential primary and/or nominating contest, 23 in 2008 and 34 in 2016, other than Shirley Chisholm, who won three non-traditional contests in 1972. Margaret Chase Smith was the first woman to launch a notable campaign for a major political party’s presidential nomination, in 1964, for the Republican Party. Seven of Hillary’s eight great-grandparents were born outside of the United States. In her autobiography, Living History (2004), Hillary stated that her maternal grandmother was of part Native American ancestry. The official website of the National First Ladies’ Library lists Hillary as having Native American ancestry. However, no Native American (or Native Canadian) ancestry has ever been documented/verified for Hillary Clinton. Hillary’s paternal grandfather was Hugh Simpson Rodham (the son of Jonathan Rodham and Isabella Simpson Bell). Hugh was born in Kyo, co. Durham, England, to parents who were also from Durham. Jonathan was the son of Joseph Rodham and Elizabeth Scurfield. Isabella was the daughter of Thomas Bell and Elizabeth Dawson. Hillary’s paternal grandmother was Hannah “Anna” Jones (the daughter of William Jones and Mary A. Griffiths). Hannah was born in Pennsylvania, to Welsh parents. Her mother was from Merthyr Tydfil in Wales. Hillary’s maternal grandfather was Edwin John Howell, Jr. (the son of Edwin John Howell and Emma Josephine Monk). Hillary’s grandfather Edwin was born in Illinois. Hillary’s great-grandfather Edwin was born in Bristol, Gloucester, England, the son of Edwin Howell and Jane Sophia Babb. Hillary’s great-grandmother Emma was born in Canada, the daughter of John H. Monk, whose parents were English, and of Sarah Abbs, who was English. Hillary’s maternal grandmother was Della Murray (the daughter of Daniel Murray/Murry and Delia Martin). Hillary’s grandmother Della was born in Illinois. Hillary’s great-grandmother Delia was born in Michigan, the daughter of Antoine Martin, who was French, and to Mary Anne Frances McDougall, who was born in Windsor, Ontario, and had French-Canadian, as well as Scottish, and very distant Dutch, ancestry. Hillary’s matrilineal line can be traced to Jeanne Ducorps dit Leduc, who was born, c. 1649, in France. Hillary’s step-grandfather was Max Rosenberg, a Russian Jewish immigrant. Max married Hillary’s maternal grandmother, Della Murray, and the couple had a daughter, Adeline (Rosenberg) Friedman. Adeline formally converted to Judaism later in life, after marrying a Jewish man, Clarence Friedman. Hillary’s brother, Tony Rodham, was married to Nicole Boxer, the daughter of U.S. Senator Barbara Boxer, and the two have a son.